Antiperspirant vs Deodorant: What's the Difference? Which is Best? Did you know that deodorant and antiperspirant aren’t the same? It’s okay if you didn’t; most people think they’re interchangeable — but they aren’t. 1) Deodorant controls odor – not sweat. 2) Antiperspirant blocks sweat – but isn’t designed to stop odor. 3) Using deodorant and antiperspirant together is the best way to beat sweaty armpits and foul body odor. 4) Antiperspirants and deodorants do NOT cause cancer. Most people associate body odor with excessive sweating, but your sweat doesn’t actually stink. Body odor occurs when the proteins and fat in your sweat mingle with the bacteria on your skin. The parts of your body that do produce an odor when sweating, have two things in common: more bacteria growth and apocrine glands. See, not all sweat glands are created equally. The apocrine glands, located primarily around your underarms and groin, tend to be the most stinky because they sweat they produce is laced with fat and proteins. When this mixes with the bacteria on your skin, it creates a funky odor. Also, because some parts of your body are more prone to bacteria growth, they are also more prone to unwanted odors. Areas that aren’t prime breeding grounds for bacteria can still sweat, but they won’t stink. For example, you might sweat a lot on your face or have a problem with clammy hands, but your face and hands don’t have an odor when you’re sweating. On the flip side, areas of your body that are prone to high levels of bacteria, such as your armpits and groin area, do get a funky odor when you sweat. Basically, body odor is produced by that specific combination of fat and protein in your sweat mixing with bacteria on your skin. Deodorant works by killing the bacteria on your skin. This way when you sweat, there isn’t enough bacteria sitting on your skin to create an odor. Your armpits and pubic area have thousands of hairs. These hairs hold on to bacteria and sweat, which is why, when it comes to body odor, these are the most problematic areas of your body. When and Where Should You Use Deodorant? Deodorant is meant to be used on your armpits. However, some women also use it underneath their breasts. It’s also common for people to swipe deodorant along their upper inner thigh — the bikini area — to help mask odors and prevent chafing. But it’s important to remember that these aren’t places that deodorant is meant to be used. For these body parts, baby powder is a much better — and safer — option. You should apply deodorant to your underarm area when you get out of the shower. But you need to wait until your skin is fully dry. You can also apply deodorant mid-day if you feel like you’re starting to get a bit funky. After all, you don’t want to be the person in the office that’s stinking up the room. It’s embarrassing. Fortunately, you can purchase travel-size deodorants to keep at work, in your gym bag, or even in your purse to make mid-day applications easy and convenient. In addition to layering on the deodorant and baby powder, you can also use body spray, perfume, or cologne to help mask any unwanted odors throughout the day. If you’re on a mission to find the best deodorants on the market, you might be a bit disappointed to know that there’s not really a one-size-fits-all solution. Everyone’s body is different. So the deodorant that your bestie swears by may not be the right option for you. That’s okay though because there are plenty of products available. You could even opt for an all-natural or homemade deodorant over a more traditional brand. Natural vs. Non-Natural If you swing for the natural stuff, your deodorant options are limited. The natural experience does have a downside. Deodorizing is often less effective. The application experience can be like rubbing peanut butter in your pits. The baking soda in natural deodorants is notorious for burning armpits. If that doesn’t bother you, check out Native, Schmidts or a Crystal Deodorant. Glide (Application) Most people apply deodorant at least once a day if not twice daily. A deodorant stick with a smooth glide can be the difference between fresh comfort and great pits of fire. Consider glide when buying antiperspirant to avoid unnecessary skin irritation. How long does it control odor? Even if a deodorant smells great. Consider testing it odor fighting longevity. If it doesn’t get you past lunchtime, you need something stronger in the odor defense category. Sometimes you may have to sacrifice a sweet smelling deodorant for one that keeps odor away longer. Hopefully, you can find a deodorant smells great and lasts all day. Combination Antiperspirant Deodorants Most options you’ll find at the store are a combination of deodorant and antiperspirant. So if you pick up a product from a popular company, such as Secret, Speedstick, or Dove, and read the label, there’s a good chance you’ll notice that the product is actually both a deodorant and antiperspirant. This is a good option for you if you want to mask body odor and prevent sweating. But if you sweat excessively, the antiperspirant that’s in your deodorant may not be enough. You should consider using a stronger antiperspirant, such as SweatBlock, in addition to your deodorant. Natural and homemade deodorants don’t have an antiperspirant in them. This means that unless you rarely sweat, you would need to use an antiperspirant too. Most natural options are made using plant-based ingredients and scented with essential oils. If you have sensitive skin, consider purchasing or making unscented natural deodorant. If razor burn is a problem for you, consider using a spray-on deodorant that includes a moisturizer. Just make sure it’s alcohol-free so it won’t burn when you apply it. If you have sensitive skin, consider using a deodorant made using coconut oil. This should help avoid any skin irritation problems you might be experiencing. If you experience excessive sweating, pick up a deodorant with a clinical-strength antiperspirant. If you’re worried about sweaty armpits or sweat stains on your favorite shirts, you need antiperspirant, NOT deodorant. 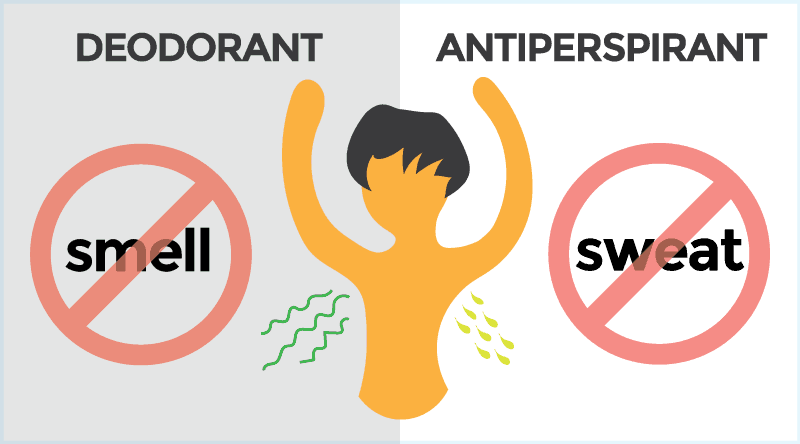 Antiperspirant helps you stop sweating, deodorant does not. Your body is covered with hundreds of thousands of sweat glands. Not surprisingly, there are high concentrations of sweat glands on the soles of your feet, palms of your hands, forehead, cheeks, and in your armpits. These are known as the eccrine glands. Sweating helps regulate body temperature by releasing extra heat via the skin. Sweating can be triggered by a variety of things including exercise, hot weather, anxiety or emotional stress. For some, sweating is excessive and uncontrollable. This kind of sweating is classified as Hyperhidrosis. No matter who you are or how much you perspire, sweat can seriously cramp your style. Antiperspirant can block the sweat, eliminate embarrassment and give a real boost to your confidence. Antiperspirants use aluminum salts to block sweat. When the aluminum comes in contact with sweat, it turns into a gel that forms a plug over your sweat glands. This plug will reduce the amount of sweat released to the skin surface. Sweat is still produced by your sweat glands, but it won’t be released in areas where antiperspirants have been applied. When and where should you use antiperspirant? If sweating is bothersome or embarrassing, you should use antiperspirant. If you experience excessive sweating, you should use a clinical strength antiperspirant. Unlike deodorant, antiperspirant can be used on most areas of the body including underarms, hands, feet, face, back and chest. We don’t recommend using antiperspirants in more sensitive areas (groin) without first talking to your doctor. If you want to get the most out of your antiperspirant, you need to apply at the right time. Applying antiperspirant in the morning, fresh out of the shower, followed by a swipe of deodorant is NOT going to keep you dry. You should apply antiperspirant at night — before you go to bed. This gives the antiperspirant ample time to “activate”. When you’re sleeping, sweat glands are less active and your body is at rest. This creates the optimal environment for antiperspirant to work its magic. This is extremely important when using clinical strength antiperspirants. Clean, dry skin + sufficient time to work will make all the difference. Good question. Trusting a list of random antiperspirants from a popular blog may not be the best way to find the right sweat stopper for you. Instead, here’s a few things to consider when choosing an antiperspirant that will work best for you. How much do you sweat? How severe is your perspiration? Mild, moderate, heavy and extreme sweating will require different types/strengths of antiperspirant. A drugstore antiperspirant like Degree or Old Spice might be sufficient for light to mild sweating. But for more severe sweating cases, you’ll need something stronger like an extra strength, clinical strength or even prescription strength antiperspirant. First, the label will indicate a general antiperspirant strength level (i.e. 12hr, extra strength, clinical strength). Clinical and prescription strength are the strongest you’ll find over-the-counter. For the most severe sweating cases, a prescription antiperspirant might be the best option. Second, the active ingredient (and percentage) will indicate how strong an antiperspirant is. Aluminum Chloride is typically the strongest active found in over-the-counter antiperspirants. An antiperspirant with 10% aluminum chloride will be less effective than a product with 14% aluminum chloride. Common active ingredients include: Aluminum Zirconium, Aluminum sesquichlorohydrate, aluminum chloride, aluminum chlorohydrate, and aluminum hydroxybromid. It’s important to note that certain antiperspirant actives may work better for you than others. Does it work, does it have social proof? This one is easy. Check the reviews. Google, Amazon, and Walmart have thousands of customer reviews. Look for anti-perspirant brands that have lots of reviews with more positive than negative. Avoid unknown brands with little feedback. Look for FDA approved formulas and avoid products from China. Does Antiperspirant do anything for body odor? While antiperspirant products aren’t meant to mask body odor, they can help. The bacteria that makes your stink is responsible for breaking down the sweat on your skin and turning it into acid. It’s that combination of the acids and bacteria that make you stink. So if your sweat glands don’t release any sweat for the bacteria to break down, you’re less likely to have body odor in the first place (or at least it won’t be nearly as pungent). In this modern age it’s nearly impossible to use or consume products that haven’t been labeled as “bad”, “dangerous”, “toxic”, or “cancer causing”. Is Antiperspirant bad? If you’ve wandered the echo-chambers of mommy bloggers and bored celebrities, you might think so. But the truth is… antiperspirant doesn’t cause cancer or alzheimers. In fact, beyond skin irritation and itching, antiperspirant is relatively harmless. Deodorant vs Antiperspirant: Which one is better? Honestly, this is like asking if food or water is better? You need them both. But when you’re thirsty, you drink water. When you’re hungry, you eat food. If stopping sweat is your goal, antiperspirant is the better. If fighting odor is your goal, deodorant is better. How do I tell the difference between antiperspirant and deodorant while I’m shopping? Usually products are labeled as either an antiperspirant, deodorant or both. Antiperspirants typically use some sort of aluminum to temporarily block the sweat glands from releasing moisture. Deodorants don’t usually contain aluminum. Instead, they contain fragrances and antibacterials to reduce odor. Common antibacterials include alcohol, baking soda, coconut oil and cornstarch. If you’re just looking for deodorant, find something that has a nice fragrance with a bacteria-reducing base. If you’re looking for an antiperspirant, look for aluminum in the active ingredients list. You don’t have to choose between having stinky armpits or soggy armpits. As long as you use antiperspirant and deodorant correctly, you can certainly use them together to control sweat and eliminate foul body odor. It’s important to clarify what “together” means. If you apply your antiperspirant and deodorant at the same time, the results will likely be… disappointing. Antiperspirant needs time to activate on the skin without the interference of moisture, sweat, soap or deodorant residue. 1) Apply antiperspirant BEFORE deodorant. 2) When applying antiperspirant, make sure your skin is completely clean and dry. Even leftover soap or deodorant residue can hamper the effectiveness of your antiperspirant. 3) Let anti-perspirant dry and activate for a 2-3 hours before applying your deodorant. 4) For stronger antiperspirant, apply at night and don’t apply deodorant until morning. 5) Here’s a bonus tip. To avoid sweat stains, make sure deodorant (and antiperspirant) is completely dry before putting on your shirt. There are several differentiating factors when comparing deodorant to antiperspirant. Antiperspirant reduces and blocks unwanted sweat. Deodorant masks unpleasant body odor. Antiperspirants use aluminum compounds to block sweat. Deodorants don’t typically use aluminum (combination products are the exception). Antiperspirants can cause minor skin irritation due to the aluminum compounds and alcohol used. Deodorants can also cause irritation due to some fragrances and sodium bicarbonate used. Antiperspirant does NOT cause cancer. Deodorant doesn’t cause cancer either. Deodorants cannot stop sweat… not even a little bit. If body odor is the problem, start comparing deodorant brands. Choosing the best deodorant is easy. For most people, it just comes down to what smells better. If you’re trying to control sweat, stick with antiperspirant products. If you’re trying to treat excessive sweating, go with a clinical strength or prescription strength antiperspirant. Believe it or not, antiperspirants and deodorants are a fairly modern invention. Before the late 1800s, people mostly drenched themselves with perfumes in an attempt to hide their horrible body stench. And when we say they drenched themselves in it, we aren’t kidding. The ancient Romans and Greeks literally bathed in perfume and soaked their clothes in it. Some even doused it on their horses and pets. Those who suffered from excessive sweating usually tried to hide it with strategic clothing and sweat pads. The first deodorant hit the market in 1888. It was called Mums and it was more of a paste rather than the sticks, gels and sprays were used to today. Shortly thereafter, the first underarm antiperspirant, Everdry, came out in 1903. However, it would be another 20 to 30 years before deodorants and antiperspirants became an everyday part of American life. Sweat and body odor were still considered a taboo topic, so people just didn’t talk about it. Believe it or not, we have an iconic Ladies Home Journal Odorono advertisement to thank for introducing deodorant and antiperspirant into the homes of millions of Americans. While most Americans were aware that antiperspirant and deodorant existed, many felt that they had no need for it. The Odorono advertisement in Ladies Home Journal changed this by telling readers that sweat and body odor were a major social faux pas, and if you had it, you could almost guarantee that people were gossiping about it behind your back. Soon, women were rushing to the store to purchase antiperspirant and deodorant. Eventually, they started buying it for their husbands too. Today, the antiperspirant and deodorant industry is worth $18 billion. But while we’ve come a long way from soaking ourselves in perfume (or just being OK with our stench), many of us are still confused about the difference between antiperspirant and deodorant is. The answer is simple: deodorant masks body odor, while antiperspirants prevent sweat.